The Institution window of the Plan Menu is where you enter the institution name and professional identifers. 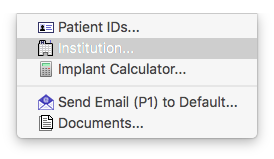 You can create institutional group presets in order to support multiple institutions or different groups of physicians (e.g. multiple ophthalmologists) within the same institution. To create an institutional group preset, fill out the various text fields, enter a unique presets dictionary key, and click the + button to add the keyed preset to the presets library. The presets library is saved as an xml plist file located in the same folder as the PS preferences file so you can copy it to other computers. 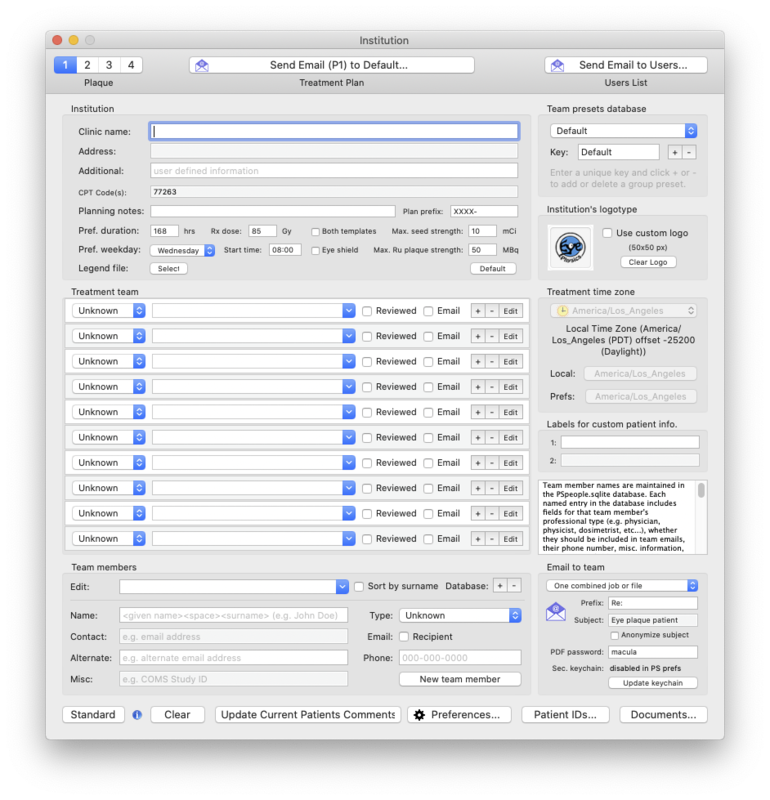 You may also create institutional presets from the Users Preferences pane. To remove a keyed preset, select it from the popup menu and click the - button. To update (ie overwrite) an existing preset, simply select it from the popup menu, change the information, and click the + button (same as creating a new preset). Each member of a group may be tagged as being a recipient of email messages. Clicking the Send Email button in the toolbar transmits an Applescript message to the MacOS Mail app on your computer which creates an email message for the curently selected plaque, addressed and cc'd to the currently selected recipients. This message includes a brief summary of the treatment plan to which you may optionally add additional comments and/or attach an encrypted .pdf file of the full treatment plan. If you are comparing alternative plaque options you will need to create a separate treatment plan document and email for each alternative (e.g. plaque 1 vs plaque 2). In the Email group box you may elect to subdivide your plan (and email) to meet email attachment file size limitations.